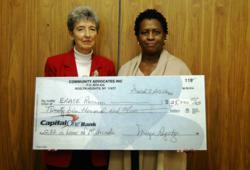 Community Advocates awards Long Island based civil rights organization ERASE Racism $25,000 in support of their second decade of work to eliminate racial inequities in the region. ERASE Racism has become widely recognized as the anchor and change-agent concerning the policies and practices affecting equal access to non-discriminatory housing choices..."
Community Advocates, a Long Island non-profit with a 40-year history as a catalyst for social justice and racial equity, particularly in housing, is giving a precedent-setting $25,000 grant to ERASE Racism in recognition of its remarkable accomplishments during its groundbreaking first decade. Since 1972, Community Advocates has raised public awareness about inadequate resources and services, designed collaborative strategies and mobilized coordinated efforts to address unmet needs and combat inequities and injustices. Since 1986, Community Advocates has concentrated primarily on efforts to address homelessness and the lack of affordable housing on Long Island, especially for African Americans and Latinos.